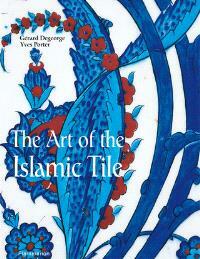 Présentation en anglais Islamic ceramic tilework is surely one of the most magnificent forms of decorative art in the world. Through the centuries, Islamic potters and craftsmen have displayed a skill and ingenuity that verge on the miraculous. From Morocco in the west to India in the east, their work adorns mosques and minarets, palaces and mausoleums, revealing an extraordinary mastery of form, function, and design. The architecture of the Islamic world represents an incontestable high point in the art of ceramic decoration, and employs an inexhaustible source of decorative motifs : from floral to figurative, from geometric to allegoric, all in sumptuous, vibrant color. The art form continues to amaze and inspire today. This volume presents a broad panorama of Islamic architectural decoration in all its diversity, drawn from a vast area including Spain, North Africa, Turkey, Iran, and the Indian subcontinent. Sumptuous illustrations-accompanied by a texte that places each monument in its historical, architectural, and technological context-conjure up a dazzling, magical world of fabulously decorated buildings, revealing the secrets of the techniques that made them possible.